The Shanghai Commercial & Savings Bank (SCSB) has bought a majority stake in local microfinance institution AMK. AMK Microfinance, one of Cambodia’s largest MFIs, says the move will aid its expansion in Cambodia’s crowded financial sector. Its CEO, Kea Borann, said at a press conference yesterday that SCSB will provide the support they need to strengthen their position in the local market. 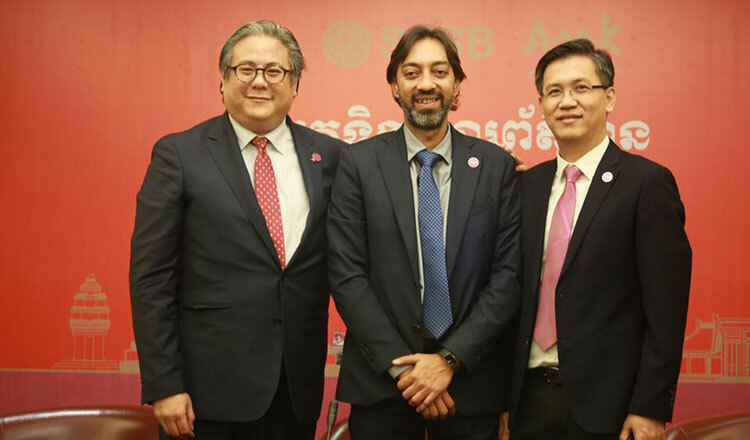 “The banking sector in Cambodia has now reached a digital revolution that requires banks and microfinance institutions to invest in new technologies to make their financial services more flexible and diversified. “By becoming a member of SCSB, we are not only gaining experience and skills, but we also gain access to new sources of investment,” said Mr Borann, clarifying that, despite SCSB’s majority in the business, AMK’s name and logo will remain intact. John Yung, SCSB’s chief information officer, said the China-based bank brings more than 100 years of experience that will help AMK improve its offer of financial services to meet the needs of Cambodian SMEs. By the end of last year, AMK’s total outstanding loans stood at $214 million, up from $161 million in 2016, while total deposits were $121.6 million, from the $90.6 million a year earlier. Cambodia has 39 commercial banks, 15 specialized banks, 7 money-deposit institutions, 70 MFIs and 302 rural credit institutions, according to the latest report from National Bank of Cambodia. Loan portfolios in the MFI sector reached $4.85 billion during the first half of 2018, an increase of 34.2 percent. Up to 1.8 million Cambodians took out loans with an MFI at some point during the first semester of the year. Most loans were taken out by small entrepreneurs in the agriculture sector (23.8 percent), trade (18.2 percent), service (10.3 percent), logistics (4.7 percent) and construction (4.3 percent).